The 2018 World Cup is a soccer event so huge, even I’ve head of it. If you’re reading this in America, it’s the Superbowl of soccer; if you’re reading this in Brazil, you know what it is already. Point is, it’s a vast sporting event – over a billion people watched the last one, in 2014, according to FIFA – with a more or less captive audience, because it’s time-limited. No-one wants to wait a few days and see if they can get a sneaky torrent of it. You want to watch it live, as it happens, and cry along with the rest of the nation when you lose to Germany in the second round. It’s not like TV companies – including streaming TV on the internet – don’t know this. That’s why they charge so much. And, since copyright law is carefully designed to enrich 1: lawyers, 2: Disney and Time Warner, and 3: not you, pricing differs sharply from place to place. When it’s free next door and expensive at home, what do you do? In the case of the World Cup, broadcasting rights have been bought by over 80 countries around the world, often with several providers in that country having the right to screen matches. Each of those countries has had to negotiate their own deal with the organizing body and with their consumers. In some locations like the UK, the whole event will be shown for free on ITV and the BBC. In others, premium or pay-per-view channels will be making a small fortune from viewers who have no choice to buy a month of cable or pay pay-per-view premiums to watch the matches. … and everything else. Sports viewer are increasingly waking up to the fact that VPNs can conceal their whereabouts and let them watch free TV. 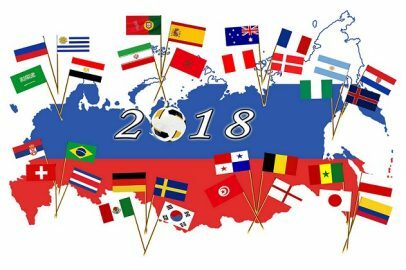 While the rest of the world wants a VPN that will let them watch American Netflix, soccer fans are looking into using VPNs to watch free British TV coverage of the World Cup. ExpressVPN CEO Harold Li told Quartz that while they don’t keep activity logs and therefore don’t know what their users are doing on the network, much of their 10% traffic spike in the weeks before February’s Superbowl came from specific pages or partner links related to the Superbowl. And during the last Olympic Games in 2016, NordVPN saw its sales grow by 104.72%. VPN providers like HideMyAss tell a similar story of spikes in traffic and sales before major sporting events – probably helped by offering special deals in the run-up to the Winter Olympics. TV events like the beginning of a new series of Game of Thrones also seem to trigger spikes, though they’re usually smaller in comparison. VPNs work by taking your traffic over a virtual network – encrypted, secure, but using the internet to carry the information – to a server of your choosing, where it emerges into the normal web looking like normal traffic (more or less). At that point, any tool that uses the origin of your traffic to figure out which country you’re from – so it can stop you from watching millionaires rolling around on the floor clutching their hamstrings in mock-agony – sees your location as the same as your chosen server’s. Which means you can arrange to be anywhere in the world you like. With a few clicks, you can move too. Need to see the Superbowl, but live in France? Just watch Rugby in slow motion. With your VPN you can simply change the server your traffic comes out at and you’re able to access the web-based video your heart desires. Not all VPNs work on all services. Because Netflix are hostages to the copyright agreements of their content providers, they have to be seen to take steps to stop people watching Netflix outside their region, so many VPNs don’t work on Netflix anymore. But large VPN providers with big, robust networks often offer specific servers to access American TV, the BBC and so on. Want to see the World Cup for a few dollars a month, instead of whatever your cable provider has in mind? Check out our VPN guide now! I have been using PureVPN for year and a half now. It is the best vpn app I have used so far. Their customer support is also amazing. Solves all the problems at hand.I’m happy with my experience thus far. PureVPN is faster than proxies I’ve used in the past, and I appreciate the option to select from multiple servers in multiple parts of the world.